The daring Tom challenges Jerry like the sibling’s challenges each other in a tiff, that dare you, Jerry, eat me! The frosted sugar Grey Jerry looks more than happy to catch tan Tom while he is all ready to sneak out. We all have such monsters in our home who may fight but cannot do without one another. 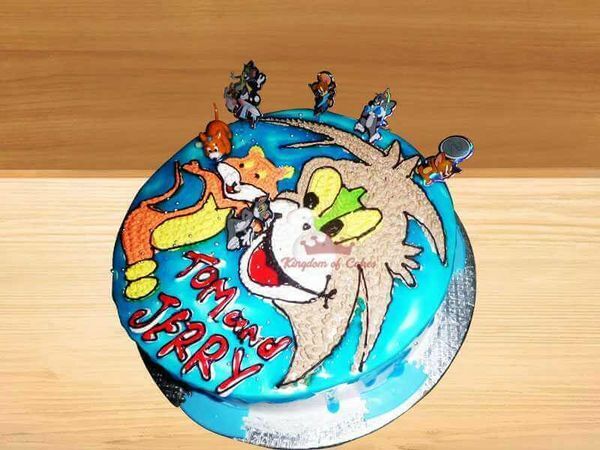 Do the needful, get this Eat me Monster Notorious Vivid Creamy Cake for such monster to celebrate Tom and Jerry Chase Saga. We do not have any partner bakeries in your area but you can still continue browsing our marvellous designs to make your occasion memorable. Enter your user name or email address, and we'll send you a password reset Email.